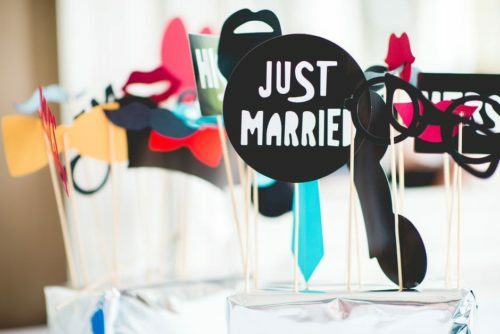 Why have a photo booth at your wedding? Your guests will LOVE it! It might take a little time for your guests to warm up to the idea, but once they have had a taste of it they will be queuing for another go. Photo booths are an absolute hoot, your guests talking about it for weeks. Whether it is the kiddies or the grandparents – it attracts all ages and you can create some magical memories with all the family. Capture those moments in a guest book. A copy of the photo is put into a guestbook and your guests write a message next to their photo – a great way to cherish the evening and fun to look back on for years to come. Not so long ago it was the disposable camera left on the tables which were used to capture those special people and moments but now the photo booth has taken their place. The photo booth is perfect for getting that instant group photo and you can have some fun with it too with the props provided.